Neometals has finalised a deal with Mineral Resources and Ganfeng Lithium to sell its 13.8 per cent stake in the Mt Marion lithium project in Western Australia for $103.8 million. Ganfeng and MinRes reached an agreement to jointly acquire the assets for $51.9 million each last December. The deal pushes MinRes subsidiary Process Minerals International’s existing interest in Mt Marion from 43.1 per cent to 50 per cent. The deal represents MinRes’ wider strategy of incorporating value-adding lithium opportunities, as well as Neometals’ ongoing divestment of non-core assets. Neometals’ cash balance has been boosted to around $131 million (plus $7 million in investments) as a result of the sale of its stake in the project. The company is focusing instead on pushing its Barrambie titanium-vanadium project (also in WA) towards a final investment decision later this year. An updated definitive feasibility study (DFS) is expected to be released in April 2019, according to Neometals. Neometals managing director Chris Reed said the company would continue to take a measured approach to capital allocation and the timing of its investment decisions. “We are fortunate that despite challenging capital markets we retain significant flexibility and optionality with respect to the timing, quantum and structure of investment into the development of our portfolio of existing growth projects,” he said. 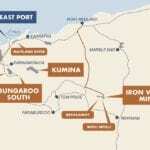 The acquisition is part of a recent spending spree by MinRes that includes the acquisition of Cleveland-Cliffs’ Asia-Pacific tenements (including the Koolyanobbing iron ore project) and BCI Minerals’ Kumina iron ore deposits, as well as continued works at the Wodgina spodumene plant. This has contributed to a 598 per cent rise in year-on-year spending $494.2 million, with further spends in the 2019 financial year estimated at $751 million. Mineral Resources managing director Chris Ellison said the spending reflected a strategic decision to invest in “a number of longer-term growth projects”. The Mt Marion mine could produce up to 400,000 tonnes of spodumene concentrate a year. The project’s mineral resource estimate stands at 60.5 million tonnes at 1.36 per cent lithium and 1.09 per cent iron.